Kevin first posted this on his blog, MyMediaDiary.com. The first thing out of my mouth when my son called me at work and told me the power was out should not have been, "Oh my God! Unplug the new TV before it gets fried when it comes back on!" Perhaps I might have first considered, after verifying there were no downed lines on top of my kids, that our poor hairy dog was okay in the 94 degrees. But I didn't. Or, based on terrible back-flooding of raw sewage in the basement of our first house, you'd think I would remember that without electricity, the sump pump won't work. The insurance company didn't come through for the sewage in '95. Flood insurance doesn't apply if your basement is "flood-ed" apparently. It was a similar corporate shoulder-shrug last year when the power surge from DTE Energy's faulty do-dad on the pole in our yard (which they acknowledged) was not their fault. $900 damage to our TV, furnace and even Christmas lights was our responsibility. I tried to complain through their channels, even filing a complaint with the state, only to finally reach the dare-to-sue-us "nope" from a woman who had no email address. "Sir, we would never get anything done if we had email." I didn't know that was an option. But maybe she's was right. 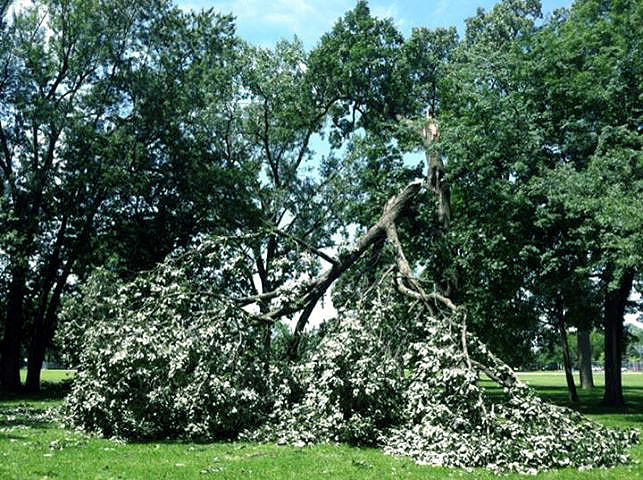 At 6 p.m., we lost our power in a sudden storm that brought 60 mph winds and snapped ancient trees in half. Needless to say, over 100,000 of us were in the dark. Out came the cell-phones and our eyes immediately looked to the top right to see the lifeline to the outside world -- the percentage of battery life remaining. 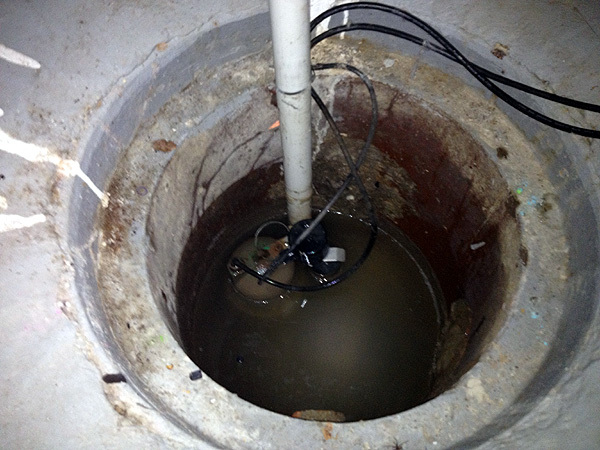 I'll admit, the health-hazard of bacteria-filled water crossing the floodplain of my son's man-cave didn't register until I asked him if he'd unplugged the over-burdened power-strip that supported the receiver, blue-ray player, television, etc. Two hours it took me to think of that scary hole in our basement floor. I pulled out my cell-phone/flashlight and gingerly removed the cover -- making lots of noise so the millipedes could escape. Our 1929 house has this little cistern in our laundry room with the most unfortunate appliance sunk in its bottom -- our sump pump. The plumber put in a new one a few years ago and recommended a backup--"...in case you've got a power outage during a major rainstorm." Cheap 'ol Kevin said no to that one. I heard the major rainstorm begin, even through the basement wall, as I noticed the flood-level rising in the pit before me. I considered my options: A. The bucket brigade or B. Nasty mouth-to-hose siphoning experience. I was going to bravely suggest my son try Option B when I heard it--like the cavalry's bugle. 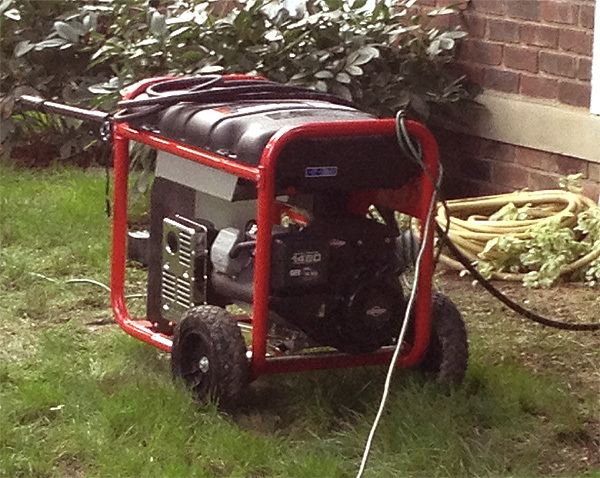 My neighbor Justin had a generator -- and I didn't even know this! How could such a valuable tool exist just doors away and not be known to my grasping, borrowing fingers? 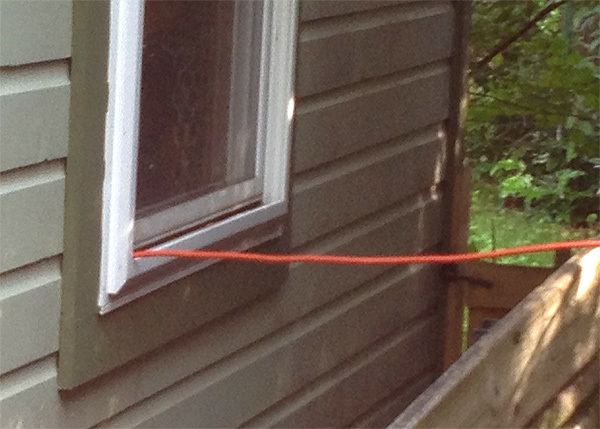 Three extension cords later, one running through my garage window, I was back in business after Aidan and I fed the cord through a bent-screen window. The pump was a-pumpin' and I saw the level drop eight inches. And now, even without air-conditioning on a sticky evening, I could sleep peacefully! The power just clicked on a few minutes ago and I dashed inside to re-join the human race. Televisions, refrigerator, microwave, air-conditioner, computer (that I'm writing upon right now), and cell-phone charging. Is this how lame I've become -- or perhaps I've always been this lame. "You know you've reached a new level of dependency when you consider abandoning your book and driving to a further movie theater--since it will allow the phone to charge longer during your neighborhood's power outage." Ours is out too.. I sat in Starbucks for an hour and then in my car with the AC on for an hour just to help stay cool and charge my phone. Who cares about the refrigerator full of food, my phone was on 13 percent !